In the ever-growing world and large scale globalization era, there is hardly a person who would not be listening to music on an occasional basis. But there are times when you are away from the internet but in the tremendous need of one or the other form of music. So, AudFree comes to your rescue in that case. AudFree is an audio app which helps you to capture music from a variety of sources, including those which do not allow you to extract the music from their copyrighted access stores and platforms. With AudFree as a platform, listening to music offline has become a lot easier as it does not need an internet whenever you want to enjoy music. Why Should You Use AudFree? This is an important question which needs to be addressed to because there are a lot of other products in the industry. So, the users need to know why this particular app is better than the others and also why they should strictly choose this one only. So, as an answer to all those types of questions, you should select AudFree because it has a lot of features which are difficult to find in any other app. Some app there might be missing one app, or some other might be losing another. But AudFree is one that has combined access to those features which makes your life much more comfortable. So, you should choose AudFree above them all. Many times we encounter some good and mesmerizing music which we do not know enough details of, but want to listen to them again. But due to less information, it becomes too hard to have a track of such music. Using the AudFree music app, you can easily play a radio station of your choice and instantly record the music if you like it so that you are free to enjoy it in future whenever you need. Since the music is saved offline, you can enjoy it even if you don’t have access to the internet. With the AudFree Audio Capture app, you can easily record and download the music from any platform. You can download music from Spotify, iTunes, Tidal, Amazon Music, etc. for no extra cost at all. Also, you can download the music from other apps such as YouTube, Dailymotion, Facebook, Twitter, etc. So, it is a simple thing now that if you like music from a video or a social media site, then you will certainly have it if you are using the app called AudFree. 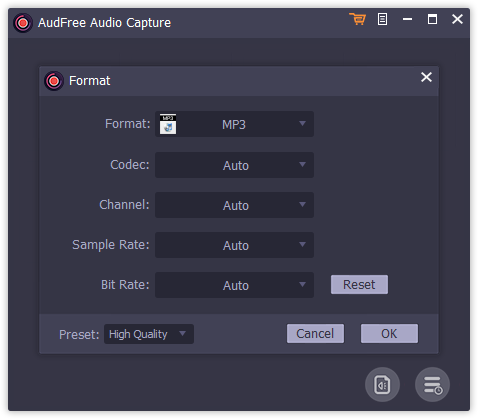 If you are using AudFree Audio Capture as one of the applications, then you can enjoy the privilege of recording the music in any of the formats as you please. The formats supported by AudFree are MP3, AAC, WAV, FLAC and many more. Also, while converting the music to various forms as you need. So, you can just let go of all the worries as you can play these types of music across all the devices which support the formats without any issue of copyright violations. It is because AudFree Audio Capture takes care to make the music free from DRM and you do not need any specific device to play the recorded and converted music. When converting the music from any format, you need to look at all the aspects and properties to increase its quality standard. So, AudFree Audio Capture gives you to choose the bitrate, sample rate, format, quality, speed, audio, frequency, etc. This way you can make your music a high-quality one and not just a low quality recorded music which even you would hate to listen to after a week. AudFree takes care of the quality for you. 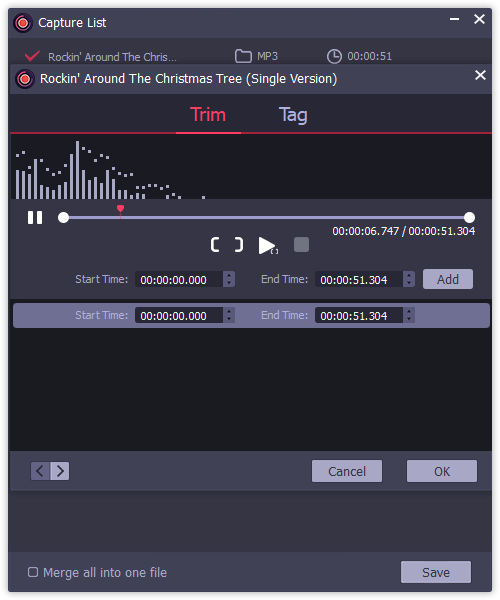 With the Aufree audio capture, you can easily split, trim or merge music according to your needs and requirements. You can make it a ringtone or background music by the audio editor tool. 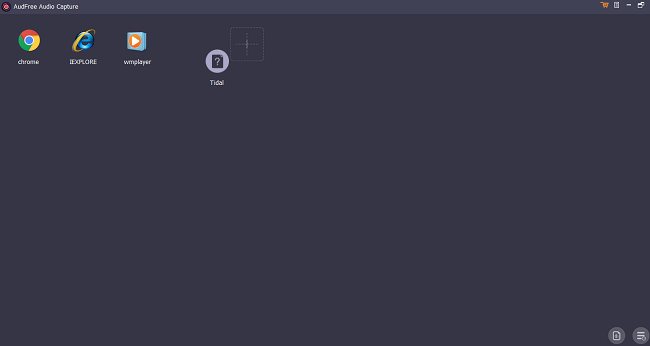 Also, you can easily edit the4 ID of the music to allocate a genre, artist, year, etc. to the music so that it is right on quality and acceptance. You can also watch the real-time conversion and output preview before the final output is delivered. Hence, better service is available using the AudFree tool. The user interface of AudFree Audio Capture is extremely, and it is straightforward to use the tool. The entire process is based on a click and drag based mechanism, and no hassles are generally faced. But, for any issue that may arise, there is always a guide on the main screen which also tells the users about the new features so that they can use it easily. The presence of good customer support which is always online is also a great thing about AudFree Audio Capture. AudFree Audio Capture is a free tool, but you do have to pay an initial amount which is necessary. However, there is a free trial pack where you can easily watch out and test the features of the tool before actually paying the money. So, the money is worth funding and is required only after you are satisfied with the services. This was all about AudFree Audio Capture which is an excellent tool, and we recommend everyone to use it at least once before making any comments about the tool.